This is my first attempt at making what I call a round box. I saw videos on YouTube showing how people make drums with their homemade jigs. I do not know how to play the drums so I decided I would make the wooden shell and make a round box. The shell is made from 20 pieces of walnut. The pieces are cut as staves. Still need to make the bottom and top lid. 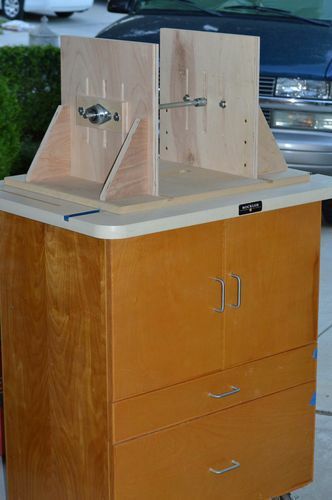 Outside cutting jig sits on top of the router table. Inside cutting jig. Circle must be large enough for your router to fit inside. My Bosch router was too tall. 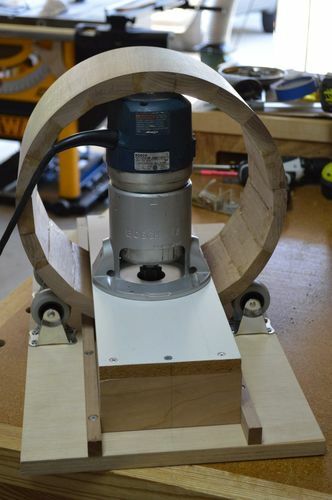 I had to install my small trim router and make several passes to enlarge the inside diameter. Then I finished the inside with the large router. Thanks for sharing, the jigs are great. Great jig, and great solution! This is a great idea for large rounds. Thanks. Julian, Great Work! What type of router bit(s) are you using? -- "Truth is not based on belief but rather belief is the intended response to Truth"
Creative idea, I have to keep it in mind for the future. Outstanding Jig. Good work. Thanks for sharing. WHOA! I never thought about doing something like that – pretty slick little jig and great idea!! Sure would like to see a video of that in action. Outside the box, you nailed it! What kind of bit do you use on the inside?